Alex Gibson and Ben Lambert won last year’s F1 Innovation Prize. Their winning idea was a mobile solution that would allow fans at each Grand Prix to connect to dozens of sensors at the circuit to access insights on their favourite team, get a mixed reality view of driver lines and braking zones, or buy refreshments and souvenirs. 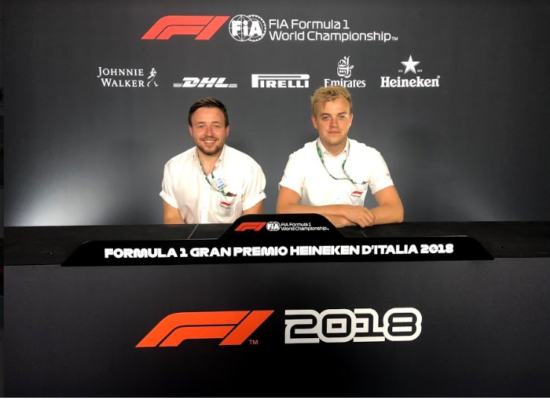 In addition to a cheque for $50,000, they got, as a bonus prize, the opportunity to have a unique behind-the-scenes experience at the Italian Grand Prix. The following is Alex’s account of the day at the iconic Autodromo Nazionale in Monza. After Ben and I won the 2017 F1 Innovation Prize, we were asked which of the races we’d like to attend. Monza instantly stood out for us for its high speeds, long history and, of course, the waves of devoted Ferrari fans cheering on their team. As a keen follower of the sport, I’d been lucky enough to attend a handful of races in the past, but this opportunity with Formula 1 and Tata Communications was a chance to see F1 in an entirely different light – behind the scenes. Things set off on Thursday morning — a briefing with the camera crews. First, a quick recap of the events at Spa the week prior, then straight into the action for the weekend ahead. I hadn’t quite appreciated the sheer number of cameras required to bring all the action to the viewers — track cameras, pit lane cameras, roaming cameras, special cameras, cameras on helicopters, cameras on rails, cameras on cars. The amount of content being captured is phenomenal! Something that’s easy to forget when you’re sitting on the couch back at home in the UK. Later that afternoon, we attended the driver press conference. It was fascinating to see the number of journalists and photographers, all crammed in to capture that perfect quote or shot. As a viewer, you don’t really get a sense of how intense the room can be — I had always assumed it was a small group of journalists. As a fan, it was great to see first hand the drivers and how they responded to questions — particularly Kimi and Seb being quizzed on Ferrari’s home turf. Towards the end of the first day, we attended the Ferrari Fan Forum in the F1 Fan Zone. It was mind-blowing to be amongst the Ferrari fans and feel their excitement with Seb, Kimi and Maurizio just a few metres away. I also felt for the broadcasters – it was apparent how difficult live TV can be when relying on teams and drivers to show up at scheduled times in a fast-paced, fluid environment like an F1 Grand Prix. I didn’t envy the Floor Manager, who must have felt at times like he was herding cats! On Friday Ben and I wandered around the paddock between Practice sessions — observing the collection of team personnel, photographers, journalists and pundits that kept growing over the course of the weekend. We were struck by the scale of the operation to move so much equipment and people, and how efficient the rigging and de-rigging process is! When spending time in the paddock, we got to see many familiar faces and F1 giants, from pundits like David Coulthard to former drivers such as Jackie Stewart and Nico Rosberg. It was awesome – if a bit surreal – to be there amongst the action. During our time in Monza, we also got to see how Formula 1 and Tata Communications bring each Grand Prix to people’s living rooms. The broadcast centre is the hub of the F1 experience for everyone watching at home. It’s incredible to see what it takes, yet it’s so easy to take for granted. We were stationed at various teams within the broadcast centre during the weekend— it was quite remarkable just how many there were, and how seamlessly they work together! Having begun my career as a motion designer, the graphics team was one of the most interesting parts for me. One of Formula 1’s graphics experts walked us through the process in-depth — the data feeds that go into the graphics, the design decisions behind them, the way in which they’re constructed with triggers and animations, and the process of initiating them for the live feed. It was a great insight into sports graphics in the broadcast world, and the unique complexities that the fast, global, and constantly evolving world of F1 brings. The challenge of balancing data to satisfy the traditional viewer whilst removing the barriers and noise for the novice fan struck me as a really interesting task. Outside of the stations themselves, we were lucky enough to stand in on one of the morning production meetings. It gave us an insight into the number of teams there were represented, and how they worked together to solve issues or try new ideas. When it came to the race, Ben and I enjoyed watching from the main desks that were pulling in all the cameras to curate the international feed. It was amazing to see all the work from the various teams within the broadcast centre come together. It was also fascinating to hear the directors communicating. To an untrained-ear it can sound like organised chaos at first, however it gave us a new appreciation to the amount of work, skill and precision required to provide a consistent and polished broadcast for viewers around the world. What struck me most was the constant drive to find better ways to convey the narrative throughout a race. That and the level of concentration maintained by everyone over such long periods of time. Overall the entire experience was one I’ll never forget, and will have a lasting effect on my appreciation for everything that goes into making my Sunday afternoons! I can’t thank the the team at Formula 1 for being so incredibly accommodating. To learn more about the F1 Innovation Prize and this year’s finalists go to the F1 Innovation Prize website. Never miss a story from Alex Gibson, subscribe now.